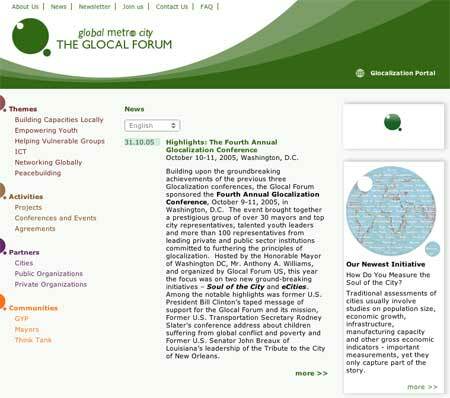 Implementation of the new website of the Glocal Forum, an international organization that promotes dialogue and cultural exchange between countries and cultures beyond the political differences. The aim of the Glocal Forum is to build a sustainable and peaceful global world, emphasizing local realities and the role of youth in decision-making. The website, rich in content, required a carefully redesign the entire information architecture, to avoid the stratification of the same and the risk of scattered communities. The site is fully accessible ("Triple A" – the third level of accessibility) and meets current standards for the design and coding XHTML and CSS. All content, and some sections of the site is dynamic and managed independently by the staff of the Glocal Forum through the desktop publishing system developed by Flyer Communication: Ecode.